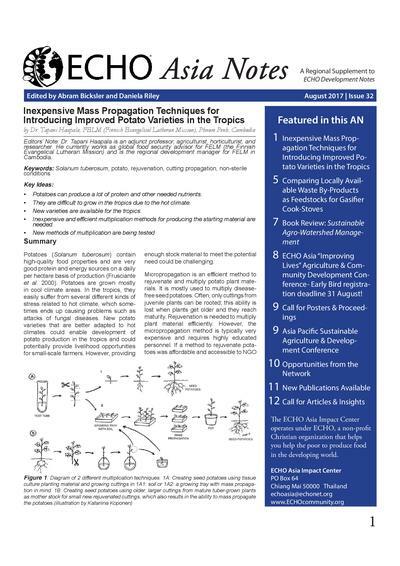 ECHO Asia Notes is a quarterly technical e-bulletin containing articles of interest to agriculture and community development workers in Asia. This list contains articles from ECHO Asia Notes, many of which have been translated into regional languages. This article is from ECHO Asia Note # 37. One of the great challenges of sustainable agriculture is the sourcing of adequate and affordable organic (carbon based) resources that can be used on-farm for the production of food and feed. Utilizing composts, manures, mulches, and other organic inputs from the farm is a challenge on its own, and the production of each often requires its own input of materials. These are materials that are often in direct competition of each other on the farm and a challenge to supply completely with smaller land holdings or available labor. A mulch for example, may be in direct competition with livestock fodder, thus making it a challenge to feed it out while still producing enough mulch. Using some of that same material to produce a compost or a fuel becomes even more challenging still. Seed saving in sub-tropical and tropical climates is challenging. Without equipment designed to maintain dry and cool environments, the quality of seeds may quickly deteriorate. High temperature and humidity during storage increase seed metabolism and encourage the proliferation of seed-eating insects (Lale and Vidal, 2003; Upadhyay and Ahmad, 2011). Technologies such as refrigerators, dehumidifiers, and pesticides can help prevent these seed-damaging conditions, but may not be available to smallholder farmers in the tropics. Traditionally, many locally available treatments have been used to prevent insect pests. These treatments, typically added to seeds prior to storage, are meant to poison, damage, or discourage movement of insects around the seeds. Some treatments may effectively reduce insect growth, but they may also damage seed viability; it is important to identify which treatments are effective and appropriate for use by farmers. ECHO Asia research staff analyzed five low-cost treatments to determine their effectiveness in preventing the growth of a common seed storage pest called cowpea bruchids (Callosobruchus maculatus) in stored Lablab bean seeds (Lablab purpureus L.). In keeping with previous ECHO research by Croft et al. 2012, each treatment was also analyzed with and without vacuum sealing. 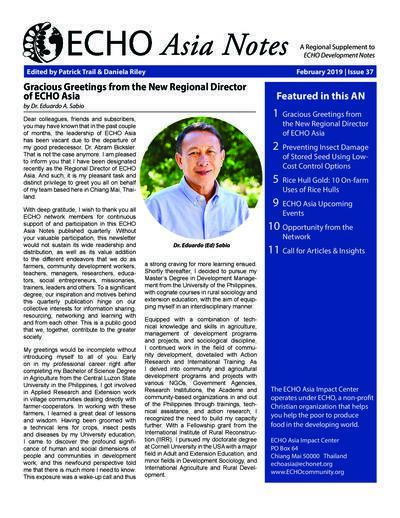 With deep gratitude, I wish to thank you all ECHO network members for continuous support of and participation in this ECHO Asia Notes published quarterly. Without your valuable participation, this newsletter would not sustain its wide readership and distribution, as well as its value addition to the different endeavors that we do as farmers, community development workers, teachers, managers, researchers, educators, social entrepreneurs, missionaries, trainers, leaders and others. To a significant degree, our inspiration and motives behind this quarterly publication hinge on our collective interests for information sharing, resourcing, networking and learning with and from each other. This is a public good that we, together, contribute to the greater society. This article is from ECHO Asia Note # 36. As an organization that seeks to equip people with agricultural resources and skills, we often find ourselves coming back to the seed. Again and again we witness the value saving open-pollinated seeds, shedding light on locally adapted and underutilized plants of merit, and researching innovative low-cost seed storage technologies. These activities form the foundation of ECHO’s ability to empower others in their endeavors to improve food and agricultural systems around the world. Building on a longstanding history of seed bank operations, first in Florida, and now Asia and Africa, ECHO continues to expand its capacity for placing seeds into the hands of those in need. In 2009, with the establishment of Asia’s Regional Impact Center and Seed Bank, the first step was taken in an ongoing process to house seeds of regional merit and local importance on location. To date, ECHO’s first regional seedbank strives to meet a growing demand for locally-adapted, open-pollinated seed from within our network, and its success attests to the wisdom of its establishment. Distributing over 4,600 trial seed packets in 2017, from a selection of 175 different varieties, the Asia Seed Bank serviced network part- ners in 29 countries, with seeds grown and produced right here in SE Asia! In light of these achievements however, demand for more seeds has stretched our capacity to fulfill the needs of a massive Asian audience, thus requiring our own explorations for further growth. This, combined with a growing challenge of moving seeds across borders, tightening seeds laws, and continued debates over ownership of genetic materials, has forced us into thinking very intentionally to the future of our seed banking activities. These questions have pushed us to consider how we might continue to serve our network in this critical realm. (2) the formation of a regional network of community level seed banks (CLSB’s). This approach has recently been set in motion, and expansion of a new seed bank is now underway. The recent procurement of new land on the outskirts of Chiang Mai (just 25 minutes from the main office) has allowed for the expan- sion from our existing seed bank opera- tion in Mae Ai (located 4 hours from the main office), and the establishment of a Small Farm Resource Center (SFRC) to be used for training and research purposes. This new and ongoing endeavor allows for significant growth of seed production and the overall capacity of our regional seed bank to service the needs of our network. In addition to housing an expanded seed bank, this site will signifi- cantly bolster our capacity for additional agricultural demonstration, innovation, and verification of the practices we seek to share. With the construction of a larger cold- storage room for seeds, increased acreage for seed production plots, and closer proximity to the city, this site will serve as a crucial piece serving our regional network with a diverse variety of locally-adapted seeds. While this increased seed bank capacity will undoubtedly multiply the seeds we can grow and disseminate, we recognize the on-going challenges of the move- ment of seeds regionally, and the need for additional local in-country alternatives. Therefore, serving as a regional hub, this new Asia seed bank will support an emerging network of community level seed banks (CLSB’s), located within countries of SE Asia and beyond. Thanks to the generous support of the Presbyterian Hunger Program, the Agroecology Learning Alliance of SE Asia (ALiSEA), the Stewardship Foundation, and generous individual givers, this network is beginning to grow and expand, one seedbank at a time. ECHO Asia, serving in a directed training and capacity building role, and leveraging the efforts of partnering seed bank staff, will work to empower each CLSB to be adequately equipped to independently produce, store, and distribute seeds of local significance. Doing so successfully will result in (1) locally available seeds should access to our seeds become obstructed, (2) greater sharing of seeds of merit among the network, (3) safeguarding of varieties should disaster strike one seed bank or region, and (4) the slowing of crop biodiversity loss locally and regionally. On a spectrum of developed and sophis- ticated, on down to simple and appropriate, a seed bank can look very differently depending on the context and its desired function. On ECHO’s Global Farm, we operate a seedbank equipped with an impressive walk-in cold-storage unit capable of precisely controlling tempera- ture and humidity, suited for storing seeds for several years at a time. At our regional seed bank located in Thailand, we operate a less sophisticated seed storage room using a split unit air conditioning system, a ‘cool-bot’ sensor, and a spray-foam insulated room, designed to be more replicable and affordable for those within our network of partner orga- nizations. Further still, for those on a lower budget and lacking access to the neces- sary technologies, and reliable electricity, we have had to explore, test, and exper- iment with other appropriate seed bank options for local communities within the region. These include earthbag building techniques and buried clay cisterns for temperature stabilization, bicycle vacuum sealing technologies, and locally available desiccant materials for drying down seeds. To date, it has been a combination of the two latter options on the spectrum that have found their way to form a set of functioning seed banks on the ground. Working in Myanmar, in the Irrawaddy Delta region, alongside our partners in the Myanmar Baptist Convention, the initial stages of a seed bank network have begun. Beginning in 2017, several prospective seed bank managers were hosted in Thailand at the ECHO Asia seed bank and trained in all facets of establishing, operating, supplying, and maintaining of a community level seed bank. Upon returning to their respective communities, the first seed banks of the network were established, and have been done in uniquely context appropriate arrangements, using different combinations of innovative options offered by ECHO. After spending two months learning the ends and outs of our seedbank opera- tions in Thailand, two of these Managers, Saw Moo Pler and Naw Doris, national staff of the Pathein Myaugmya Asso- ciation (PMA) in Myanmar, returned to the Kahelu Small Farm Resource Center where they work to establish their own community level seed bank, aimed at serving the surrounding communities with an alternative source of quality seeds. Applying the training received from seed bank staff in Thailand, a modest seed bank ‘cold room’ was constructed using earthbag building technology, used to lower and stabilize temperature. Raised bed production plots have been planted for growing out seed and supplying the seed bank, and plans are in progress for using local partner farmers to grow out various seed varieties. It was at this site that ECHO Asia hosted a Seed Saving Workshop in January that brought in dozens of local farmers and national development workers, to train on site and learn about seed cleaning techniques, storage technologies, and seed biology. Just six months later, upon returning for a follow-up visit to Kahelu, our staff were amazed at the progress this seed bank had achieved, and were reminded of the power of a good partner; the impact realized by those working in the field, in a community, in relationship, these are the network members we seek to serve. Staff at the Kahelu Seed Bank have also taken on a research component, helping ECHO to verify and field test some of the practices we promote. A small regional experiment is underway to evaluate the storage conditions of earthbag seed banks, buried clay cisterns, and hillside seed bunkers; all of which are comparing unsealed seeds and vacuum-sealed seeds using a modified bicycle pumper vacuum sealer. This ‘disaggregated research’ is a critical piece in ECHO’s ability to provide up-to-date and sound options to our network. The Kahelu seed bank is one example of an emerging network of community level seed banks, and is joined by several additional sites in Myanmar, Cambodia, and the Philippines. Many more exist throughout the region, and it is our hope to help establish, connect, and help build capacity of many more. Utilizing our new regional seed bank and small farm resource center to train partners, demonstrate innovative options, and experiment with new low-cost techniques will extend our reach beyond what we would have imagined just one year ago. Being equipped to empower our network partners in more impactful ways is what we seek, knowing that it is our partners on ground that will have lasting impact on people’s lives, physically and spiritually. Though much progress has been made in the establishment of this new facility, there lies before us so much more! We prayerfully consider each new step and ask that you might do the same, to come behind us and alongside of us, to see to it that ECHO Asia’s Small Farm Resource Center and Seed Bank might become a place of great impact. Soil chemical, physical, and biological properties range from those highly favorable to plant growth to those highly unfavorable to plant growth. It is rare—especially in the tropics—to find a soil in its natural state in which all properties are highly favorable to plant growth. 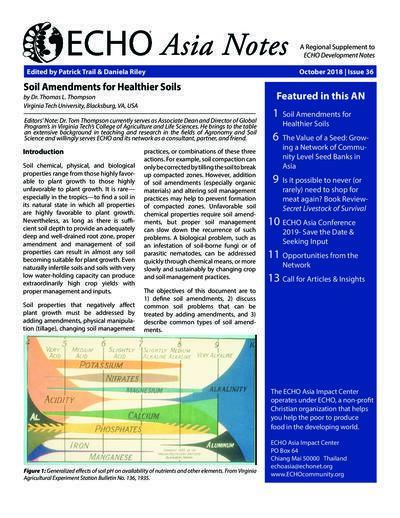 Nevertheless, as long as there is sufficient soil depth to provide an adequately deep and well-drained root zone, proper amendment and management of soil properties can result in almost any soil becoming suitable for plant growth. Even naturally infertile soils and soils with very low water-holding capacity can produce extraordinarily high crop yields with proper management and inputs. This article is from ECHO Asia Note # 35. One of the best things that you can do to complete your sustainable farm or garden is to balance it with a small livestock unit. 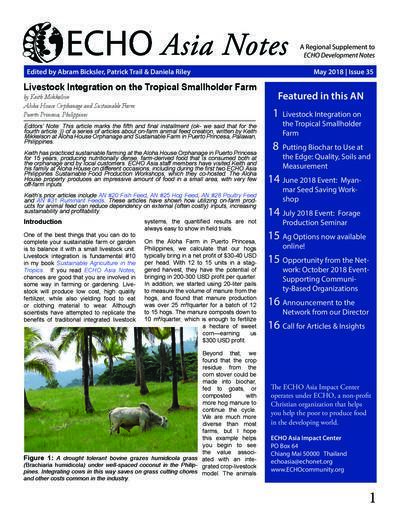 Livestock integration is fundamental #10 in my book Sustainable Agriculture in the Tropics. If you read ECHO Asia Notes, chances are good that you are involved in some way in farming or gardening. Livestock will produce low cost, high quality fertilizer, while also yielding food to eat or clothing material to wear. Although scientists have attempted to replicate the benefits of traditional integrated livestock systems, the quantified results are not always easy to show in field trials. In this article, Dr. Shafer shares his experience with the actual use of biochar in the devel-oping world. He aims to refocus the study of biochar, moving it from academic laboratories to the messy context of farms in the developing world. He hopes to reassure “boots-in the-mud” development practitioners that they can make, use and even test biochar in the field. This article is from ECHO Asia Note # 33. I read David Price’s concerns about promoting invasive forage plants in Asia Note #25 [Eds’ Note: AN #25 was written in response to AN #23] and would like to respond based on my own experience and observations. It is moral to help poor farmers as much as practicable. The primary aim of human activity is the betterment of the human condition. Thus, preservation of the natural environment is NOT necessarily the primary aim of development activities. I have been promoting the use and expansion of all of the species listed by David to smallholder farmers for, in some cases, the last 45 years. I wish to address the concerns David has for each of the species listed in Asia Note #25. I live in northern Thailand now, so I will use local examples, but the comments should apply equally as well to most of the humid and sub-humid tropics. Mushrooms such as oyster mushrooms (Pleurotus ostreatus) are usually grown in plastic bags filled with organic material that may include organic farm wastes. That material must be sterilized (heated to temperatures above 100°C) or pasteurized (heated to a lower temperature, 60°C or higher) to prevent contamination by germs, viruses and fungal spores. However, sterilization and pasteurization are challenging for small-scale farmers because of the energy requirements. Normally, small-scale farmers use a drum sterilization method, during which water is heated until it boils. Farmers must buy or collect the firewood to heat water (an expensive and/or labor-intensive task). Charcoal is even more costly to buy or to make. Also, results of drum sterilization can be inconsistent, depending on the device used and quality of the fire wood. The new, easy-to-build piece of pasteurization equipment introduced in this article is inexpensive, long-lasting, easy to prepare, and does not need fossil fuel energy. The pasteurization process does not need monitoring, so it requires less labor. 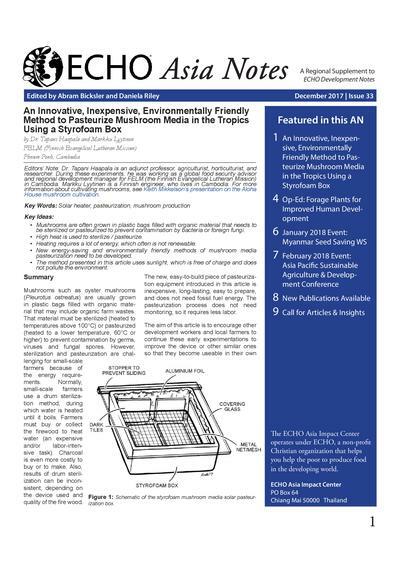 The aim of this article is to encourage other development workers and local farmers to continue these early experimentations to improve the device or other similar ones so that they become useable in their own different environments, with an aim of helping small-scale farmers save energy and money when growing mushrooms. This article is from ECHO Asia Note # 32. In many developing world households, meeting the daily energy needs required for cooking is burdensome and costly. Fortunately, low-cost cooking methods that require less fuel while burning more cleanly and efficiently are becoming available at the household level. One such method is the household gasifier cook-stove, designed to convert small amounts of carbon-based solid biomass (usually from waste or low-cost material) into combustible gases used for cooking (see Dr. Dussadee’s work for information on how gasifier stoves work (2013)).